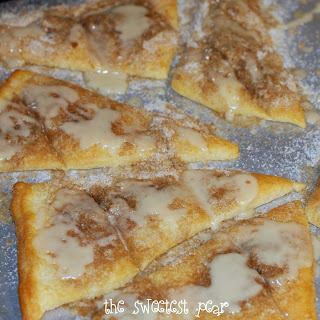 Cut in butter to sugars, cinnamon, and salt and flour to form crumbs. On an ungreased cookie sheet, separate crescent roll dough into 8 triangles. Sprinkle crumbs on top. Bake at 400 degrees F for 8-12 minutes. After they were cooked and cooled I cut them into smaller triangles but you can leave them big too!